The 18th-century Palace of Versailles is one of the most famous attractions in France. It’s also known as the Château de Versailles, or Versailles Castle, because a place this grand can’t have too many names. So how do you tackle something this legendary? With snippets of history and a 90-minute tour. Here is the best way to tour Versailles. I rushed past Neptune’s Fountain in the Gardens of Versailles. I had a 9:30 a.m. guided tour of the King’s Apartments. I’d entered the grounds through the Queen’s Gate behind the palace, and the gardens were deserted – a rare peaceful moment at the Château de Versailles. I tried to imagine Marie Antoinette here, escaping the stifling confines of the court, or Madame du Pompadour, the elegant mistress of Louis XV. Then I went over the various King Louis in my mind. The best way to tour Versailles is to know some bite-sized snapshots of history, and there are three French kings you need to know. The Sun King, Louis XIV – Louis XIV inherited the crown at the age of four, and in 1682 he moved the court to Versailles. He transformed it from a royal hunting lodge into one of the grandest palaces in Europe, adding impressive spaces such as the Hall of Mirrors, the Royal Chapel and the Opera House, forever linking his name to the Château de Versailles. 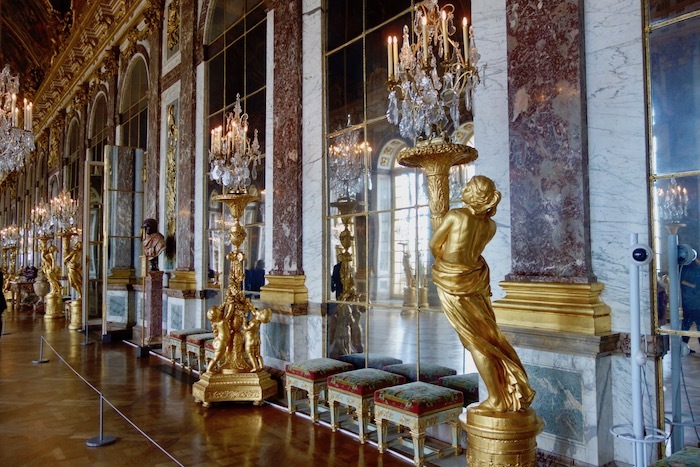 Louis XV – The great grandson of the Sun King, Louis XV continued to enhance the palace. One of his additions was the Petit Trianon, an intimate neoclassical chateau on the grounds he had built for his mistress, the Comtesse Du Barry, and which later would be the favourite haven of Marie Antoinette. A retiring man, Louis XV is nonetheless known for his long string of mistresses including, but not limited to, the four Mailly sisters, Madame du Pompadour and Madame du Barry. Louis XVI – Born at Versailles, the scientific-minded Louis Auguste was the grandson of Louis XV. He married Marie Antoinette in Versailles in 1770. Fatefully, they were both executed during the French Revolution. And that was the end of the glory days of Versailles. Finally I reached the back of the 18th-century palace. Pale and harmonious, with straight lines, 700 rooms, 2153 windows and 67,000 metres of space, the massive Baroque building spread out before me like a sun-warmed cliff. Only something was wrong. I could see people inside but the door was locked. I rattled the handle and squished my face up to the window but was totally ignored. Now what was I supposed to do? I doubted things like this ever happened to Madame du Pompadour. I paced up and down along the back of the palace – no easy feat when it’s the size of 12 football fields – and looked for a way around to the front. When I saw a woman unlocking a wrought-iron gate about 100 metres down from the palace I whipped over. “You can’t go through,” she said. Now where is the door? I was tempted to tell her to eat cake. Briefly I thought of storming the gate just as a small group of rioters did during the Women’s March of 1789. Spearheaded by a group of women in the markets of Paris, angered over the shortage of bread, the march was a key moment in the French Revolution. Armed with kitchen knives, pikes and other rudimentary weapons, they marched to Versailles in six hours, their numbers swelling into the thousands as they went. At dawn some of the protesters found an unlocked gate and entered the palace. Chaos ensued. Two guards were violently killed. Marie Antoinette barely escaped with her life. The royal family was forced to leave their hallowed isolation of Versailles for Paris. I gave the woman a plaintive look. She relented and let me through. Phew, I thought, running around the front of the building and reaching the guided tour reception area in the North Ministers Wing just as the tour was departing. Adding a guided visit is one of the best ways to tour Versailles. It’s only €10 extra on top of the regular admission price and comes with some valuable perks. 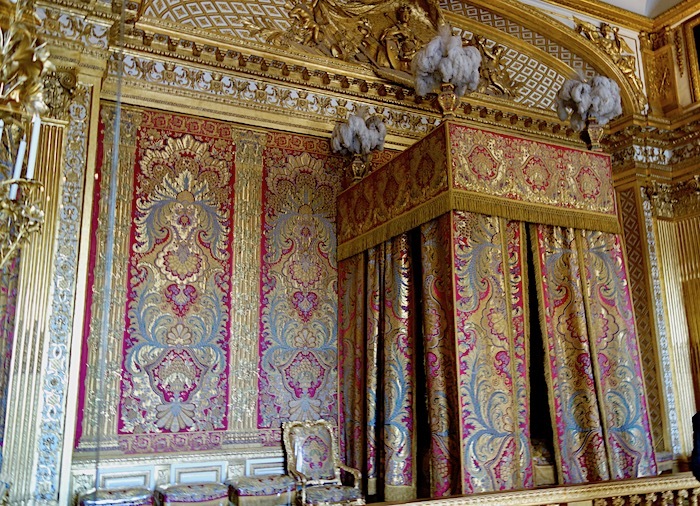 Bedroom of Louis XIV, where the royal rising and going to sleep ceremonies took place. Seriously. You can skip the long entrance lineups (though you still need to queue for the security line). While general admission includes entrance to the Grand Apartments, a guided tour takes you into the more intimate private apartments of Louis XV and Louis XVI. Your group is limited to about 25, a far smaller crowd than the crush of courtiers who used to clamour for access to the king. You can continue to explore Versailles after your tour without having to go back in line. As a bonus we were going to see the Royal Chapel. We all shuffled in over inlaid marble floors of black, white and red, then cricked our necks up to see the soaring pillars and ornate vaulted ceiling complete with cherubs and gold. 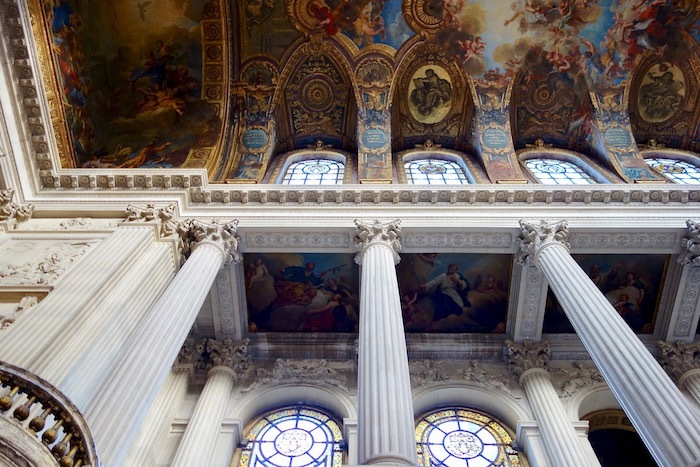 Unveiled in 1710 towards the end of the reign of Louis XIV, the two-level Royal Chapel is where Louis-Auguste and Marie Antoinette were married, and it’s here the court would gather for the King’s Mass each morning at 10 a.m. I looked at my watch, it was just 10:00 now. Pretending my companions were courtiers rather than camera-toting tourists, I enjoyed a few moments feeling imperious and aristocratic because people who had bought a regular admission ticket to Versailles without the guided tour could only look in past a rope and wonder at our splendour. Clearly, it doesn’t take much to give me illusions of grandeur. Fortunately I’d dressed for the part. I’d worn a sequined net jacket over a knit lace top. And if you think this is too many sequins for 10 a.m. I have one word for you: VERSAILLES. Don’t you think Madame du Pompadour ever dressed up? 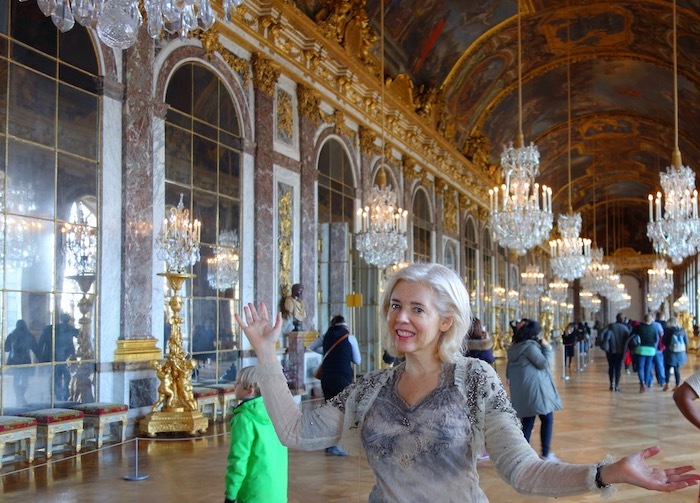 The best place for sequins in the Château de Versailles is the glittering Hall of Mirrors, so once our tour of the private apartments was finished I made my way there. Chandeliers dripped from the ceiling like crystal clouds, the sun slanted in across warm wooden floors and the 357 mirrors gleamed in the light. A long gallery connecting the Queen’s Apartments to the King’s Apartments, the Hall of Mirrors is an homage to French superiority in matters of politics, military might, art and riches (and anything else you can think of). 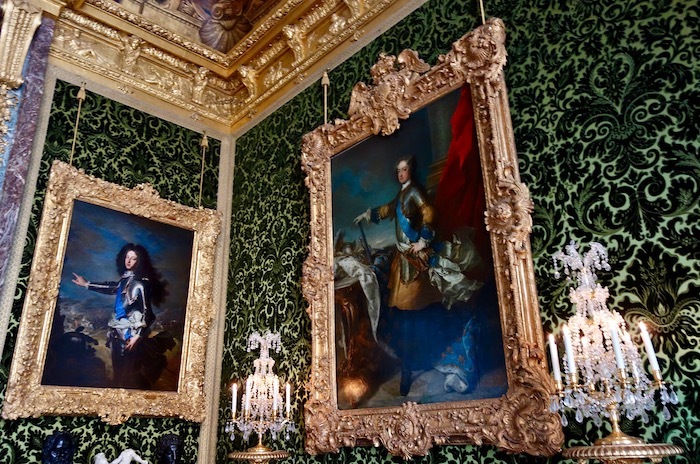 The 30 ceiling paintings depict the successful reign of Louis XIV while the mirrors, an extravagant luxury for the time, stood as gleaming proof that France could rival Venice in mirror production (even if they had to bribe Venetian artisans to move to France to make them). Basing in the reflected glory of the Hall of Mirrors, I hardly even blinked when a guard scolded me for setting my jacket on the floor (so I could show off my sequins). I was still feeling quite regal as I tromped glided out of the gallery and found my way to Ore restaurant in the Pavillon Dufour. Lunch at Ore is one of the best ways to round off your tour of Versailles. Helmed by celebrity chef Alain Ducasse, the restaurant is the most delicious addition to the palace in centuries. The decor is a modern answer to palace opulence, which means it still has bling but in a minimalist sort of way. Light fixtures look like golden postmodern suns, chairs are slim and sleek and tabletops are a dull gold. The patrons around me were mostly men in suits and chic French women toting YSL bags and Chanel. Honestly, this was as good as being in the king’s inner circle. Feeling sophisticated I ordered a glass of St Emilion Grand Cru to accompany my bavette of beef. Crash. I knocked over my glass. Red wine pooled on the gold tabletop and dripped into my lap. The other diners looked over, not a trace of sympathy on their faces. Just like that, my champagne bubble burst. My face turned as red as a wine stain. I may love luxury travel but it wasn’t going to make me an aristocrat. I was just a loser in sequins. C’est la vie, I thought as the waiter rushed over. At least at Versailles you can pretend for a day. 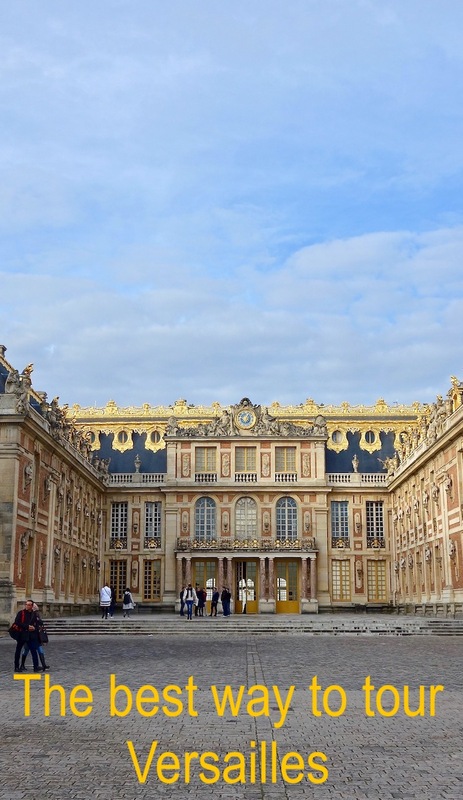 A Passport ticket allows you to see anything at Versailles that is open to the public. Cost starts at €20 or €27 for two days. If you’re not going to visit the Trianon Estate, or be there for the Musical Fountain Shows or the Musical Gardens then you can get a Palace Ticket for €18. If you have a Paris Museum Pass you can use that for your ticket. It doesn’t include the Musical Fountain Shows or the Musical Gardens. None of the entrance tickets above includes the guided tour of the Kings Apartments. The tour is about 90 minutes and costs an additional €10. It includes sights such as Louis XVI’s lock cabinet (he was obsessed with locks), his library, Louis XV’s dining room and possibly the most famous piece of furniture in the world, Louis XV’s roll top desk. English language tours are offered every day except Mondays. You can book online and check tour times on the Chateau Versailles website. You can buy your Versailles entrance ticket online on the official Chateau Versailles website. You can also buy it at the palace but be forewarned, this means an extra lineup. To buy a ticket onsite go to any Palace ticket desk located around the Main Courtyard of Versailles. The ultimate luxury? 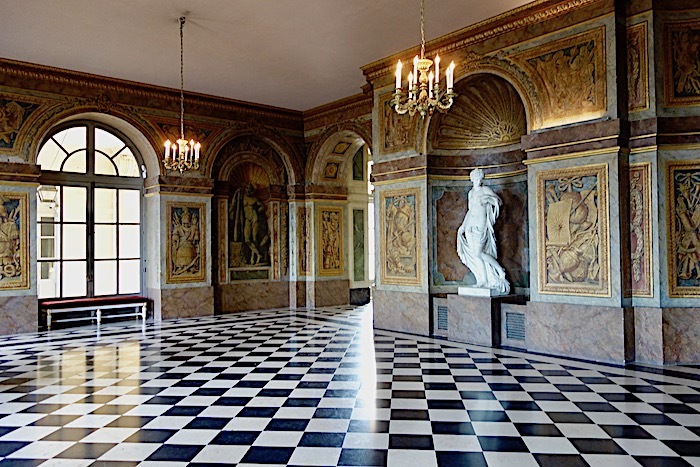 Try a private backstage tour of Versailles. It will cost you. Obsessed with French historical fashion? Do a dress up photo op at Costumes and Chateaux. Versailles is about an hour away by public transportation from Paris even though it’s only 17 km away. 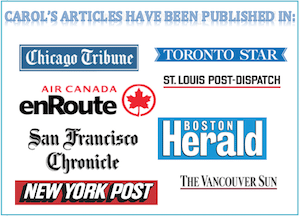 There are several ways of getting there. Travel tip: Buy a return ticket to start with, otherwise you’ll have to wait in another long lineup to get a ticket back. Another tip: The Versailles Rive Gauche Station is the closest station to the palace. The RER C is probably the best way to get to Versailles from Paris. You can catch the RER C from a number of stations including St-Michel Notre-Dame and Orsay. Buy a Paris to Versailles Rive Gauche ticket (zones 1-4). Or, from Paris Montparnasse train station take an SNCF train to Versailles Chantiers. Or, from Paris Saint Lazare train station take an SNCF train to Versailles Rive Droite. You can do bus transfers from Paris to Versailles for €35 from 3 different pickup spots. You can do a Versailles and One Nation Outlet shopping day by bus for €59. A meal at Ore is a casual-while-also-sumptuous way to end your tour of Versailles. Or to start it – Ore is also open for breakfast. But make a reservation. You’ll find Ore at the Château de Versailles, Place d’Armes, Pavillon Dufour on the 1st floor. Tel. (33) 01-30-84-12-96. Open Tuesday to Sunday 8 a.m. to 6.30 p.m. Closed Monday. For more information on the best way to tour Versailles and other top French destinations visit the official French Tourism website. Hi Marissa, For your next trip to Versailles, here’s a budget travel tip. 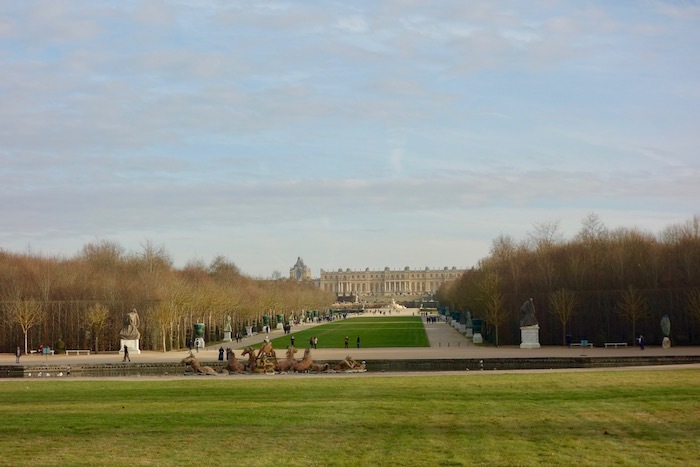 On the first Sunday of every month from November to March, entrance to Versailles is free. These are some really great tips for visiting Versailles. I went as a teenager, but I would love to go again as an adult. I love that the guided tour allowed you to not only skip the line, but explore without the hoards of people. Plus, like you said, you get all the extra information and history! It’s been my dream to go to the Palace of Versailles! I didn’t have enough time when I was in Paris unfortunately, but these tips are helpful for next time I go. I can’t believe it has 700 rooms – what do you even do with that? I love how you wore sequins to Versailles! I wish I did a tour when I visited. I just wandered around. It was my first solo trip, so I was pleased to be active, but really didn’t soak up the history as I would’ve like. Hope you got the wine stain out. So glad you were successful in getting in the castle. It’s very impressive inside. I agree, it seems that the private tour is well worth the extra 10 euros. Your jacket is perfect for the castle! We’ve been to Paris a couple of times but we still haven’t visited Versailles. Your detailed post has made us question why we’ve never been as it sounds a wonderful trip. The extra euros for the guided tour of the private apartments sounds a ‘must do’. Never been to Versailles but I really want to go there. I’ve heard so much about it! The Château looks great, but I don’t think I can live in it LOL Too rich! Thanks for the tip on how to go there. Saving it for future travels. We will be in Paris this October! 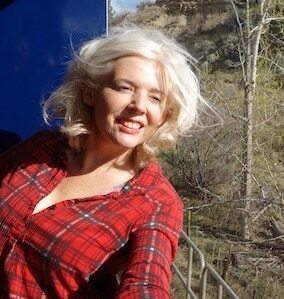 A guided tour, Ore, and a bus with return ticket are musts, I will remember. Great guide- this would have been handy to have 10+ years ago when I first visited ;-) Versailles has a special place in my heart, as it was the first real palace I ever got to explore, since I was just a few days into my first-ever Europe trip. Hi Carol. Great post. Thanks for the tip on taking a guided tour. I would also like to try Ore for lunch on my next visit. I did a post on my trip to Versailles last spring. 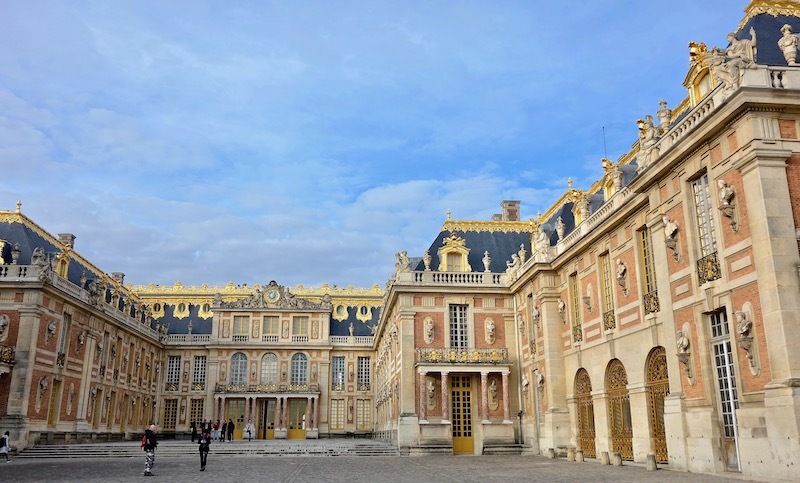 It is a nice companions piece for your blog because I focused on different parts of Versailles, with some overlap, of course, namely the chapel and the Hall of Mirrors.